Shannon Ashley Weeden, 33, of Blytheville passed away Thursday, April 11, 2019, at her home. 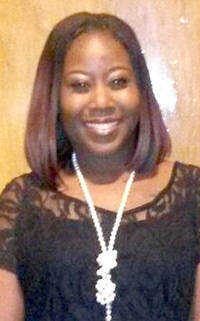 Shannon was born Feb. 20, 1986, in Blytheville and was the daughter of Richard Moore, Sr. and Harriet Weeden. She was a 2004 graduate of Blytheville High School. Following graduation, she attended flight attendant school as well as the University of Arkansas Conway and worked as a substitute teacher in the Blytheville School District. Shannon was preceded in death by her maternal grandparents, Beatrice and Shelby Shannon, and her paternal grandparents, Odell and Mae Moore, and a brother, Dante Beaugard. She leaves to forever cherish her memories her mother, Harriet Beaugard of Decatur, Ala.; her father, Richard (Linda) Moore, Sr. of Blytheville; one sister, Miesha (LaDarius) Moore-Parks of Blytheville; three brothers, Darius Beaugard of Decatur, Ala., Richard (Angie) Moore, Jr. of Blytheville and Malik Moore also of Blytheville; many aunts, uncles, cousins, and friends. Visitation will be from 5-7 p.m. Friday April 19, at McDonald-Horne Funeral Home, 1207 South Division Street, Blytheville. Funeral services will be held at 1 p.m. Saturday, April 20, at Faith and Glory Christian Fellowship, 1510 Kari Lane, Blytheville, where Reverend Adron Poole is the pastor. Pastor Raymond Golphin of Frontline Family Ministries will deliver the eulogy with burial to follow at Memory Gardens Cemetery. McDonald-Horne Funeral Home is in charge of services and arrangements. Visit us on our website: www.mhfuneralhomeinc.com and facebook page at McDonald-Horne Funeral Home.